. : 2012 CSM Vauhti Wax Guess :: Ski XCOttawa.ca :: Skiing in Ottawa and Gatineau Park :. I'm up over a dozen email requests to predict the ultimate Vauhti wax combo for the CSM weekend. Not to disappoint, I'll try again, but like I've said the last few years, this is ONLY A GUESS. I suggest reading about Ken's recent CSM course scouting report and keeping an eye on the CSM site for more updates about the grooming and snow conditions. Ok, on with the guessing.. 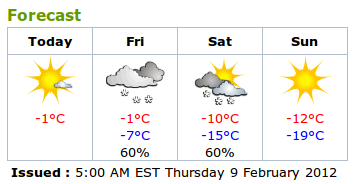 I'm using Environment Canada's forecast for Lachute and for a second opinion WeatherSpark's Lachute forecast as well. 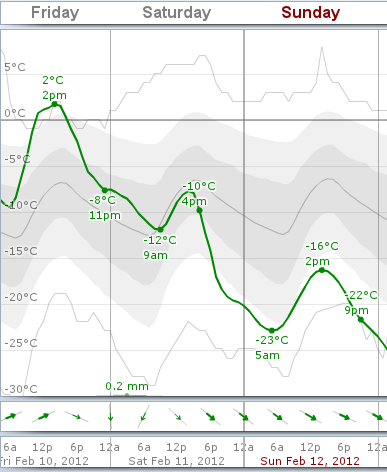 While I find WeatherSpark's data more extreme with highs and lows, the graphs helps to plan for waxing. Of course this is all subject to change many times before Saturday morning. The last snowfall was weeks ago and it was quickly followed by rain then a few freeze/thaw cycles. That makes for really transformed, hard and abrasive snow. At best there will be snow on Friday before they groom or Saturday but I would still expect lots of wear. You should start with either a hard graphite or a hard green underlayer, then a layer of HF Blue should work nicely. If you want to get fancy: Molybeden Graphite, HF Blue, Black Fox. So what binder? Blue Klister? Hmm..a good idea for the crusty base, but with 60% chance of flurries it could be dangerous. Vauhti Teho Green? Even worse than klister if there are any new snowflakes around. Vauhti Super binder - definitely a good idea. My best guess as to what would last the entire distance would be a mix of blue klister and super binder covered by the hard wax du jour. **(The link describes covering klister with hard wax but not mixing klister and binder so I've included a recipe for that at the end.). Make the binder thin and as smooth as glass to prevent drag. Freeze the binder/klister base solid then cover with the appropriate number of layers of Vauhti Orange (Carrot) to suit your skis and you are all set. Remember to make the layers thin, and if you find the grip is a bit draggy add one thin layer of Vauhti Fluor Green (-10..-20C), which shoul also help keep those pesky leaves out of the grip too. You may think Carrot is too warm a wax for highs of -10C or -12C, after all the label says -1..-6C!! Never doubt the Carrot! Its working range is actually very large. From our testing its more like -3C..-25C in the dry snow conditions we have around Ottawa-Gatineau. Best of luck and fun to all! Put on a very, very thin layer of blue klister. Heat it in with an iron/torch/heat gun and smooth it out. Allow to cool completely, freezing it is best. Next, add some binder. To do this heat the binder and dab it on top of the frozen klister. Spread the binder a bit with a cork, just so its evenly distributed. 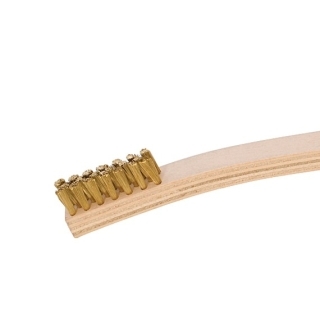 Then heat a short 2" section of klister and binder until both are both melted, and mix them together on the ski with a klister brush - small brass brush (see attached photo). Heat the next section and mix, continue for the whole wax pocket. Try not to smear too much off the side of the ski. By the time you get to the end of the wax pocket the first sections will be cool again. Make sure it looks uniform, if not repeat until you can't tell what was klister and what was binder. It will be a cloudy mixture that is somewhat tacky at room temperature. Get it as smooth as possible. You might need to freeze it and then cork it smooth. Freeze it before adding the wax of the day on top. The reasoning for the mix is that its abbrassive enough to want klister, but the possibility of fresh snow would make the skis really drag. (Klister can be really slow in fresh snow!) The mixture gives you durability and glide. A klister brush. Saves you from burning the skin on your thumbs!